When I saw this at the Innes St. Drugs soda fountain - while sipping on quite possibly the best. orangeade. ever. - I knew this was a magnet that had to come home with me. 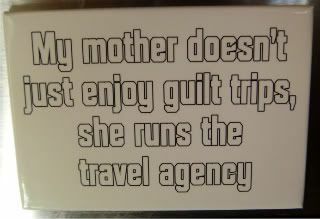 Of course, I learned a long time ago how to refuse any and all motherly guilt trips, so it technically doesn't apply. Now, complexes - the giving and the having? That's probably something we'll never get around, for sure! Wow! A whole blog devoted to magnets! And what an AMAZING collection you have, inspiring! Thanks very much, and thanks for dropping by!